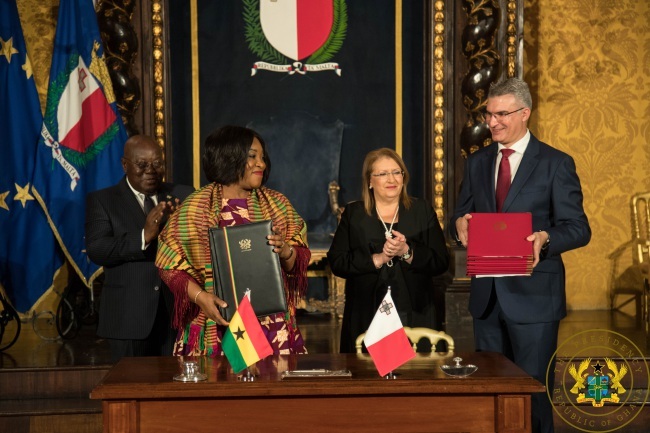 This signing ceremony took place on Tuesday, 26th March, 2019, when the President of the Republic, Nana Addo Dankwa Akufo-Addo, paid a day’s official visit to Malta, where he held bilateral talks with his Maltese counterpart President Marie-Louise Coleiro Preca. The agreements between the Governments of Ghana and Malta are: (1) MoU on Medicine; (2) MoU on Bilateral Air Services; (3) MoU on the Avoidance of Double Taxation and the Prevention of Fiscal Evasion with respect to Income Taxes on Income; (4) MoU on Tourism; and (5) Joint Commission for Bilateral Co-operation. Thanking President Coleiro-Preca for warm hospitality accorded him and his delegation, President Akufo-Addo noted that the visit to Ghana by his Maltese counterpart, in July 2017, was the first time a sitting President from the Republic of Malta had paid a State Visit to Ghana, and it was also the first time a President from Malta had visited a country south of the Sahara.